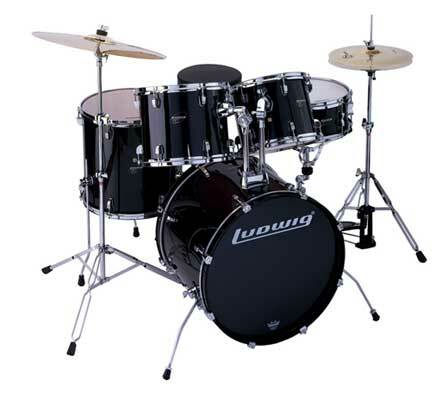 The Ludwig LJR106 Junior Drum Set is an affordable way to start 'em out early! The LJR1064 features bold new color options and comes complete with a throne and hi-hat stand. When Ludwig says complete, they mean it! This set also comes with the cymbals pictured, a bass drum pedal and all heads. Ludwig Drums There's a reason the world's best drummers are playing Ludwig drums. Because for 90 years, Ludwig has designed and crafted their drum kits and components with both eyes on quality, and both ears on sound. The Ludwig sound is inimitable. The look? To say they look good is simply an understatement. But that beauty is more than skin deep. Ludwig knows that along with your music comes a long series of setups, performances, tear downs and moves. So they build their kits to keep looking and sounding good, gig after gig after gig. Ludwig kits have been carefully selected to give you that legendary Ludwig look and sound, matched to your musical tastes, your skill level and - importantly - your budget. The Ludwig Accent CS Power Set is a great starter drum set! 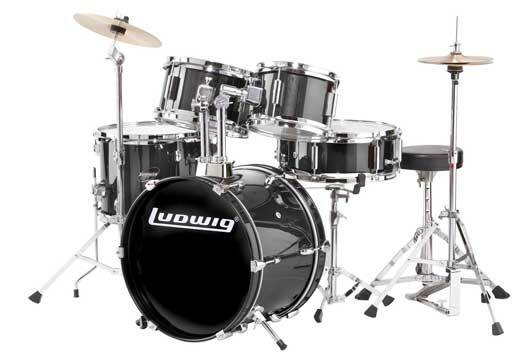 This entry-level Ludwig set is perfect for the serious beginning drummer or anyone on a tight budget. The Accent CS Combo Series LC125 Power Set includes a 16x22 inch bass drum, a 16x16 inch floor tom, 10x12 inch and 11x13 inch toms and a 6.5x14 inch matching-finish snare. Its full complement of hardware includes rugged, double-braced stands. Ludwig's Accent drum sets are quickly growing in popularity because they deliver surprising quality for their modest prices. These are great, affordable drums! Ludwig Accent CS LC125 Power Set Features & Specifications Bass: 16 inch x 22 inch Floor Tom: 16 inch x 16 inch Tom: 11 inch x 13 inch Tom: 10 inch x 12 inch Snare: 6.5 inch x 14 inch Snare Stand: L222SS Cymbal Stand: L226CS Hi-Hat Stand: L216HH Bass Drum Pedal: L215FP Drum Throne: L247TH Tom Holder: Post Style Snare Drum Lugs: 8 Bass Drum Lugs: 8 Drum Heads: Milky White Shell Material: Selected Veneers Cymbals sold separately. Click Here to see our Huge selection of cymbals. Ludwig Drums There's a reason the world's best drummers are playing Ludwig drums. Because for 90 years, Ludwig has designed and crafted their drum kits and components with both eyes on quality, and both ears on sound. The Ludwig sound is inimitable. The look? To say they look good is simply an understatement. But that beauty is more than skin deep. Ludwig knows that along with your music comes a long series of setups, performances, tear downs and moves. So they build their kits to keep looking and sounding good, gig after gig after gig. Ludwig kits have been carefully selected to give you that legendary Ludwig look and sound, matched to your musical tastes, your skill level and - importantly - your budget.